I am particularly thrilled by today’s guest blog. Loreley Amiti is not just a very talented woman, but a friend- and I am very much looking forward to seeing a copy of her brand new children’s book. 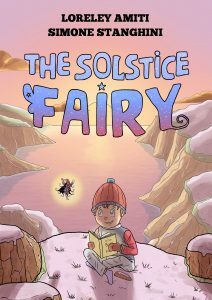 And what better time to have a book about a Solstice fairy than during Solstice itself! Hello Jenny and thanks for having me. So, what brought me here during this lovely, but also frantic festive season? “A colourful CV and social awkwardness” is probably the most honest answer. Whether the latter is down to my equally colourful heritage or three decades full of unusual decisions I don’t know. Being one quarter Latvian, Belorussian, German and Italian as well as being half Jewish and half Christian only left me with three choices: to become a comedian, a hairdresser or a writer. I tried the comedy thing to be fair. 20 years on stage from the age of 4 including stage school and the compulsory jazz hands made me realise though that I’m not extroverted enough 24/7. The hairdresser idea stayed with me for some time as well, but I’m simply allergic to too many things to have a future there. So I did the next logical thing: I studied medicine. When I met my now husband and my medical degree wasn’t acknowledged in the UK, I started many writing jobs for magazines and press agencies until I was told to get my own books out, which I have been writing over the last years. So, here I am. On my way to becoming “proper British” and yet struggling with simple questions like “How are you”, which I might answer in detail until people have to urgently wash their hair. What I love about the UK is that people tend to be very open about drastic career changes. – Which is lucky because I’ve had a few. The last one I’m particularly happy with. As a writer I get to invent people I’d actually love to meet in person. When I finish a book it’s an odd mix of relief and sadness, because I loved spending so much time with my characters. One of my upcoming books is particularly special to me: “The Solstice Fairy”. It’s about a boy called Tim for whom the darkest season of all turns out to be the brightest, most magical time of his life. By saving his mother’s helper fairy from freezing, he also restores the family’s happiness and discovers how special he is. It’s an enchanting feel-good story with a classic touch and Italian illustrator Simone Stanghini has added extra magic to the story by combining his unique comic style with colourful, retro-inspired illustrations. It’s a festive read that wasn’t inspired by anything festive at all: I was sitting in a little café in Sidmouth at the Southern English seaside when my 3-year-old daughter started a massive tantrum. It was raining cats and dogs outside, she had spilled all of her apple juice over both of us and I was a little desperate. Just then I saw a poster about the upcoming winter solstice in the window and came up with the first draft of this story. It actually calmed her down in the end, so I decided if my harshest editor (my daughter) likes it, I should turn it into a book. I hope other parents will enjoy it too and I wish you all a relaxing, tantrum-free, enchanting festive season – whatever you’re celebrating. Thanks for the morning with you, Jenny. It’s been a real pleasure. Multilingual British author, Loreley Amiti, has been working for a publishing house and the press before focusing on her own books. She writes history, literary fiction, YA and picture books, which are being published on the English and German-speaking market. Believable characters in a captivating setting, may they be historical or purely fiction, are her passion. 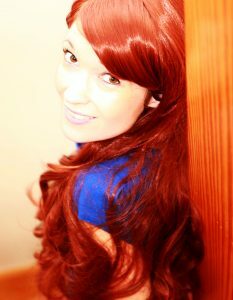 The author lives in the South West of England with her family and loves to hear from her readers. You can find her on facebook (@LoreleyAmiti), twitter (@AuthorAmiti) and Instagram (@loreley.amiti). Many thanks for such a lovely blog Loreley.